Riyadh was long the political capital of Saudi Arabia, and the country’s most populous city, but it was not until the 1970s that the Saudi government finally decided that its Ministry of Foreign Affairs should leave the commercial capital, Jedda, on the coast and move to Riyadh. That meant that a thousand or so foreign diplomats would also need to move to Riyadh, and both office and residential accommodation for them would need to be provided. A new diplomatic quarter was accordingly designated, about six miles north-west of the centre of Riyadh. The Saudis laid out most of its infrastructure between 1979 and 1982, and intended that the Ministry of Foreign Affairs should move in mid-1983. 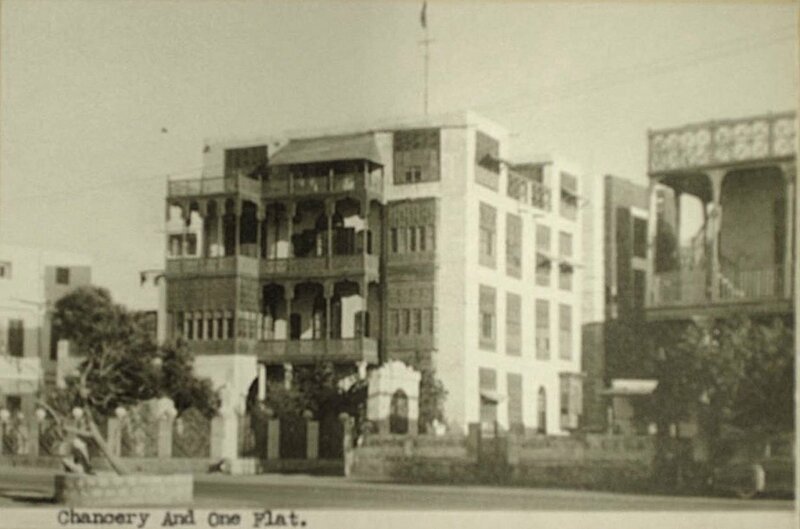 A British Liaison Office was already established in Riyadh, in the Villa Malki (a house formerly occupied by the Director General of the Saudi-British Economic Co-operation Office) and on the upper floor of the immediately adjoining Villa Arnold. A four bedroom house, known as Villa Anani, was used as a pied-à-terre for the ambassador and for other official visitors. 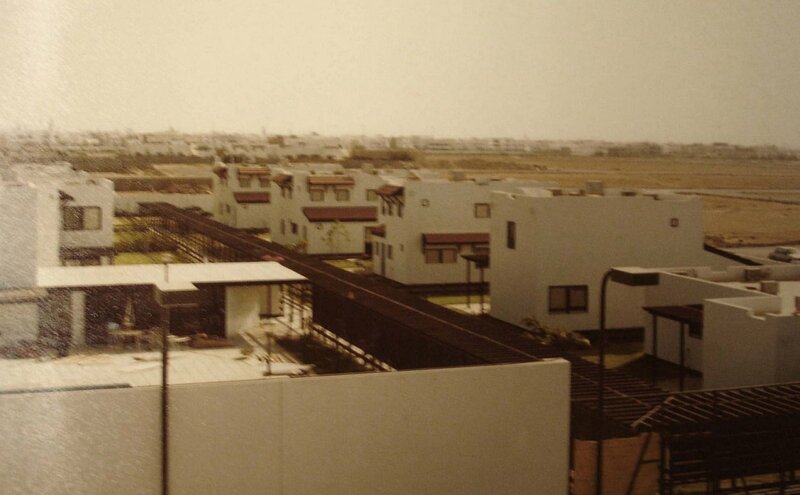 The Property Services Agency appointed Allan Low, a senior architect in the Directorate of Estate Management Overseas, as project manager for the necessary new embassy buildings, and he visited Riyadh for the first time in late 1979. 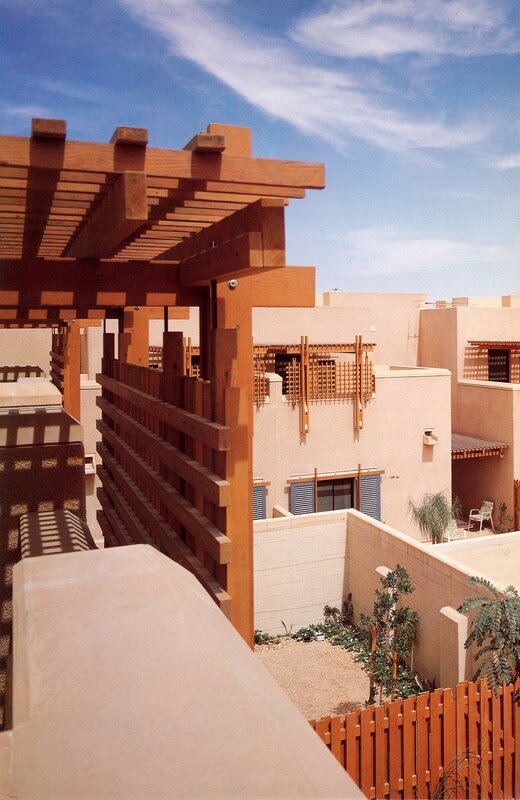 Trevor Dannatt and Partners, a London private architectural practice, were appointed in April 1980 as the architects: they had recently completed the King Feisal Conference Centre and the Intercontinental Hotel in Riyadh. The Saudis allocated a site of just over one hectare, called Plot 8, for the offices, conference hall, residence, and staff amenities. They disallowed single-nation diplomatic residential compounds, and Low and Dannatt therefore selected sites for the required 39 houses, taking as much advantage as practicable of the Saudi preparedness to tolerate small groups. Trevor Dannatt took the lead in the design of the buildings on the main site and Colin Dollimore, his partner, in the designs of the staff housing. 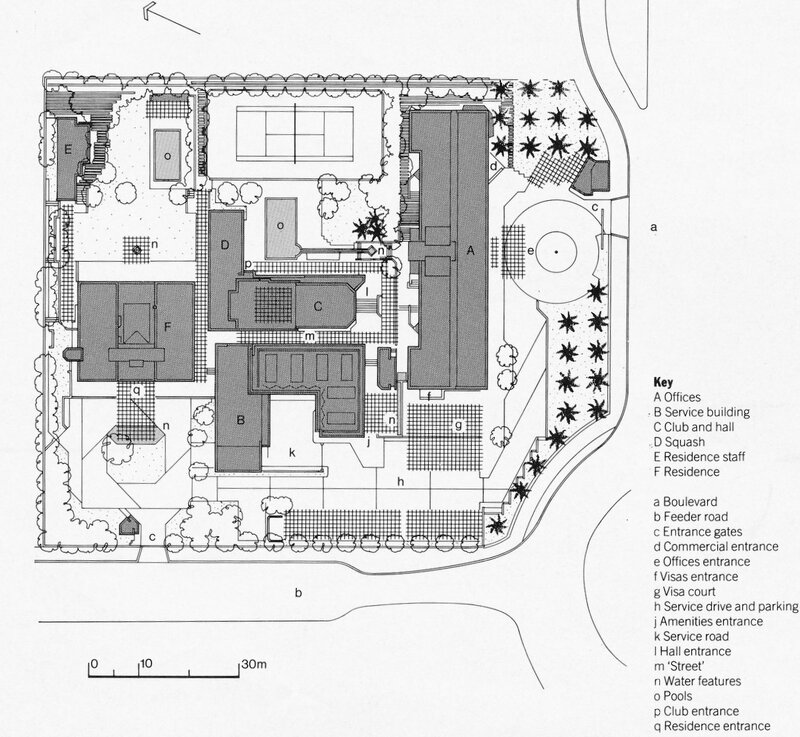 Sketch plans were ready for approval in August 1981 and a 99-year lease for Plot 8 was signed in March 1982. The contract for the main site, with a value of about £7.5 million, was won in competition with five other UK contractors by a consortium of Laing Wimpey Alizera (with John Laing International managing). Work started on site in May 1983 and made good progress before slippages in the second half of 1984 endangered meeting the occupation date demanded by the Saudi authorities of mid-August 1985. 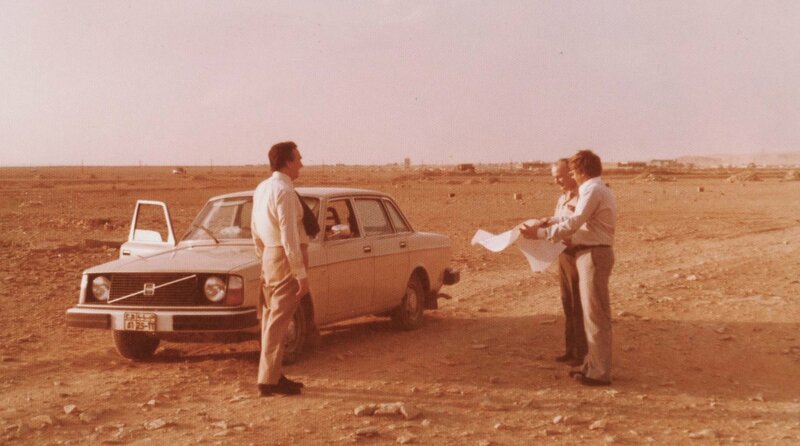 Despite the consortium withdrawing from Riyadh at nil notice, leaving the FCO to complete the works with direct contracts, an opening date in September 1985 was achieved. The houses, of six different sizes on seven sites, were all designed around small central courtyards that were open to the sky. They, too, were built by Laing Wimpey Alireza, started in December 1983, with a contract sum of about £13 million, and were completed in October 1985. The residence dining room proved too small and was enlarged in 1990 (as was the principal guest bedroom directly above). An additional 0.4 hectare of adjoining land was leased in 1993 to enlarge the residence garden and relocate the servants’ quarters. 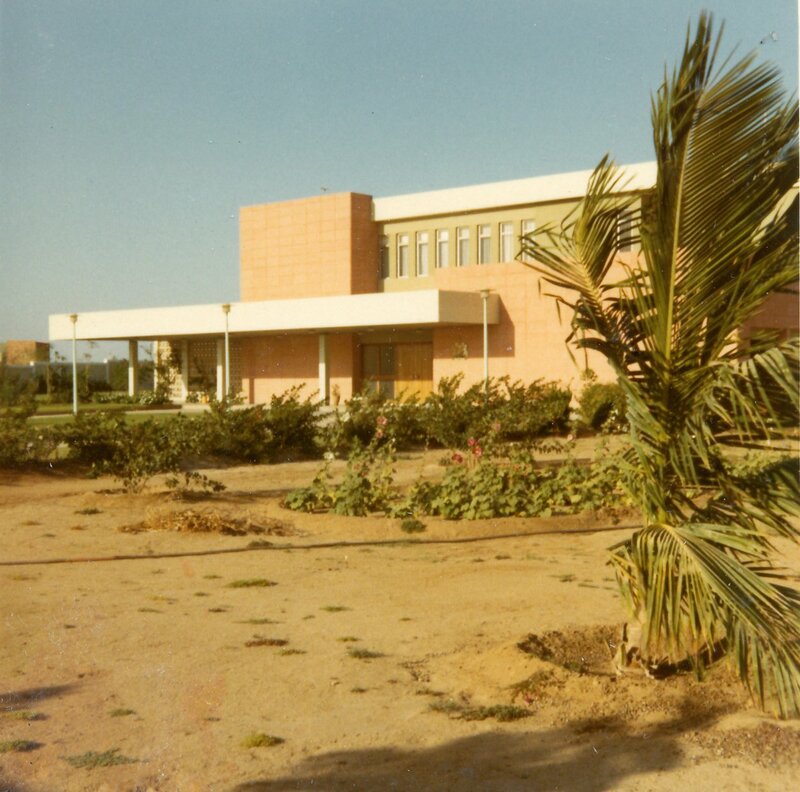 The Riyadh embassy buildings were fully and interestingly covered in The Architects’ Journal, 10 June 1987, pp.36-51. Selecting the site, November 1978. L to R: WJA Buckley FCO, JR Nicol DEMOS, DI Lewty, head of chancery Jedda. South, entrance, front of the offices, 1985. Typical house external detailing, 1985. Entrance view of residence, 1985. 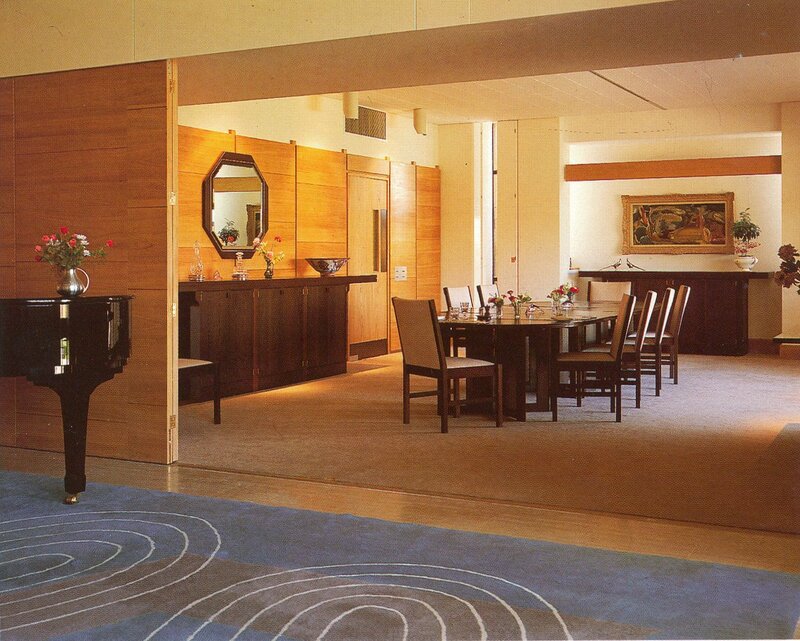 Dining room, from drawing room, 1985. 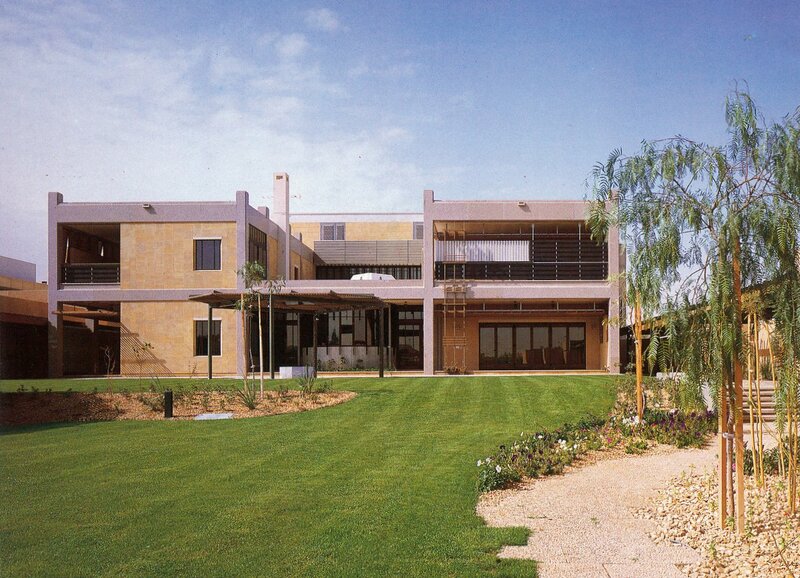 Residence from the garden, 1985. The first British minister to the new Kingdom of Saudi Arabia at Jedda was appointed in 1930. His legation leased three rundown buildings in the Ash-Shan quarter, north-east of the old town, for which the Ministry of Works took over responsibility in 1935. In the late 1930s, the sheikhs were keen to rebuild the town to the north and the opportunity arose to build a new legation. 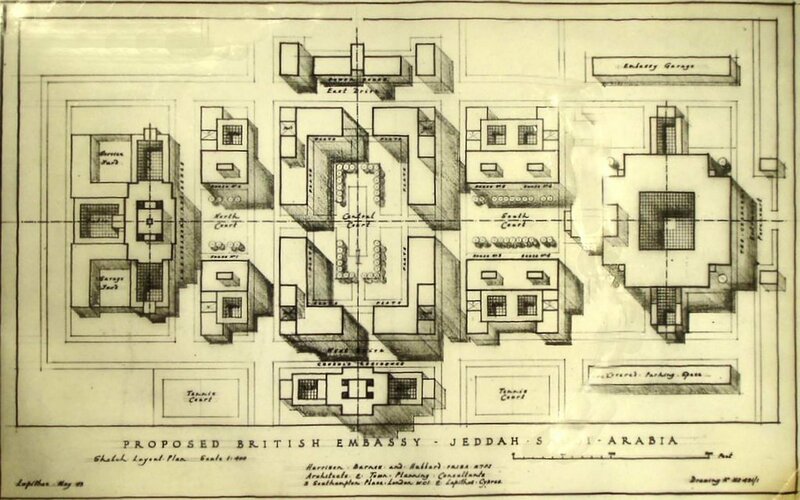 Since foreigners were not permitted to own property, a lessor scheme was devised under which the sheikhs would build and lease the buildings, but no plans materialised before the Second World War. 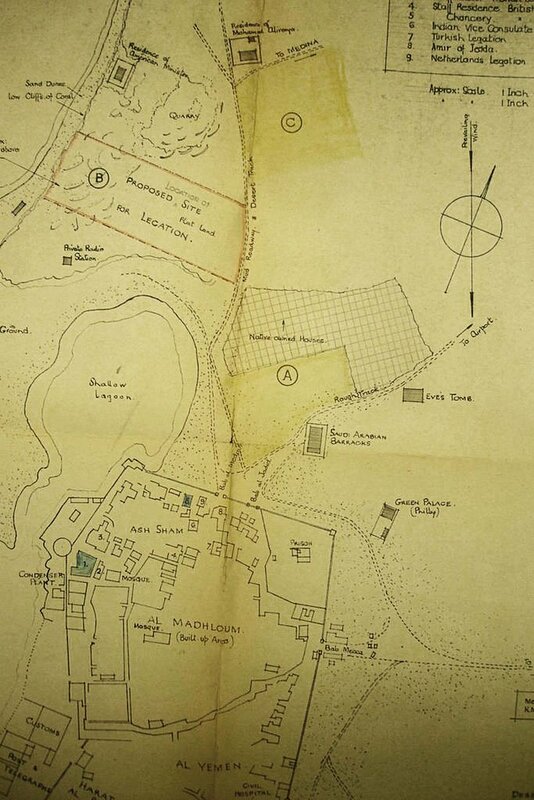 After it, a desert site next to the sea just north of Jedda was identified for a future British legation compound, and approved in 1947, but it was broken up and re-allocated to others before anything could be agreed. The mission was upgraded to an embassy in 1947. 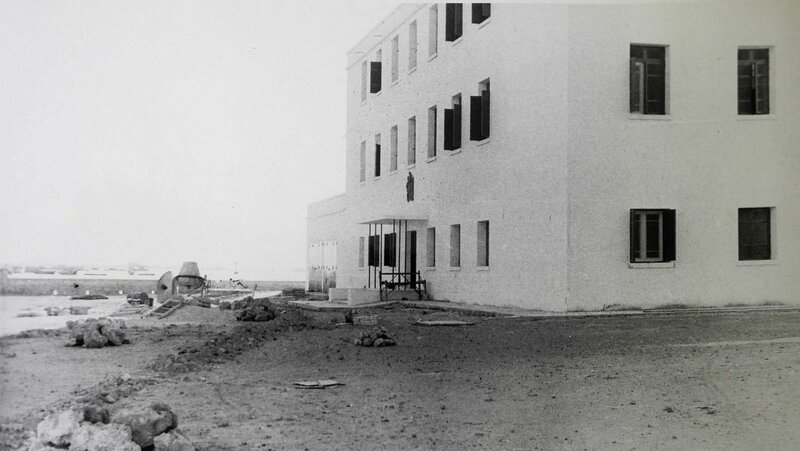 Kenneth Judd, the architect in the Ministry of Works’ Cairo office, visited in 1948 and secured a site of about 40 acres on the sea 2½ miles north of the old town centre. Site-planning for this compound was entrusted to a firm of private architects, Harrison, Barnes and Hubbard of Russell Square, London, and Lapithos, Cyprus. Their first efforts were much too compressed but a layout proposal of May 1949 held some promise. Negotiations on this lessor scheme were completed in 1950, the Treasury having eventually approved the case for air-conditioning, and a site contract was signed in August 1950. The architects completed their sketch plans in November 1951. Because the site had neither water nor electricity, and the compound was intended to be entirely self-sufficient, it included a generator house, plants for seawater distillation, sewage disposal and full air-conditioning, oil storage tanks, laundry and swimming pool. But there was no money for a scheme of such grandiloquence and it was set aside in 1952, the third proposal to fail. 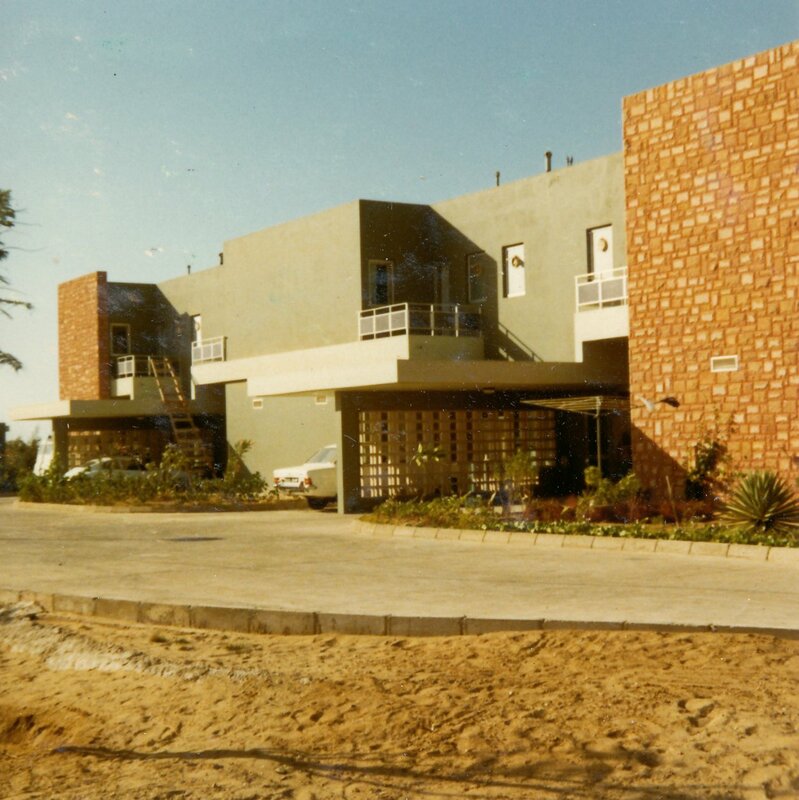 Two new buildings had been leased in 1950, Beit Inglees for offices and three staff flats, and Beit-el-Kebir for six staff flats; and a new residence, Beit Sefir, was leased in 1952. There was a break in diplomatic relations 1956-63, during which Pakistan was the protecting power. In early 1965, Prince Tallal, owner of one of the leased buildings, gave notice to quit by the end of the year. 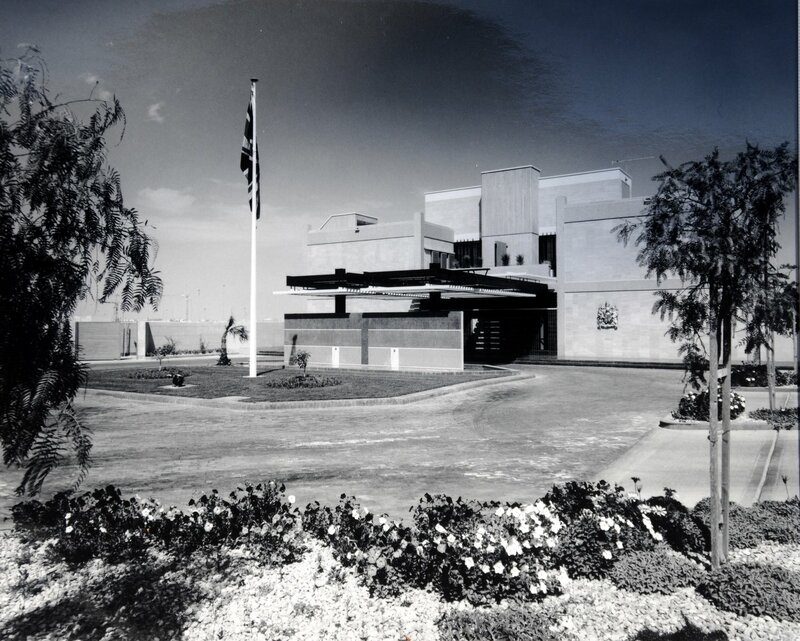 An alternative site acquired by Prince Tallal was selected in July 1965 with the objective of building a lessor scheme on a crash programme to be ready by the end of 1966. 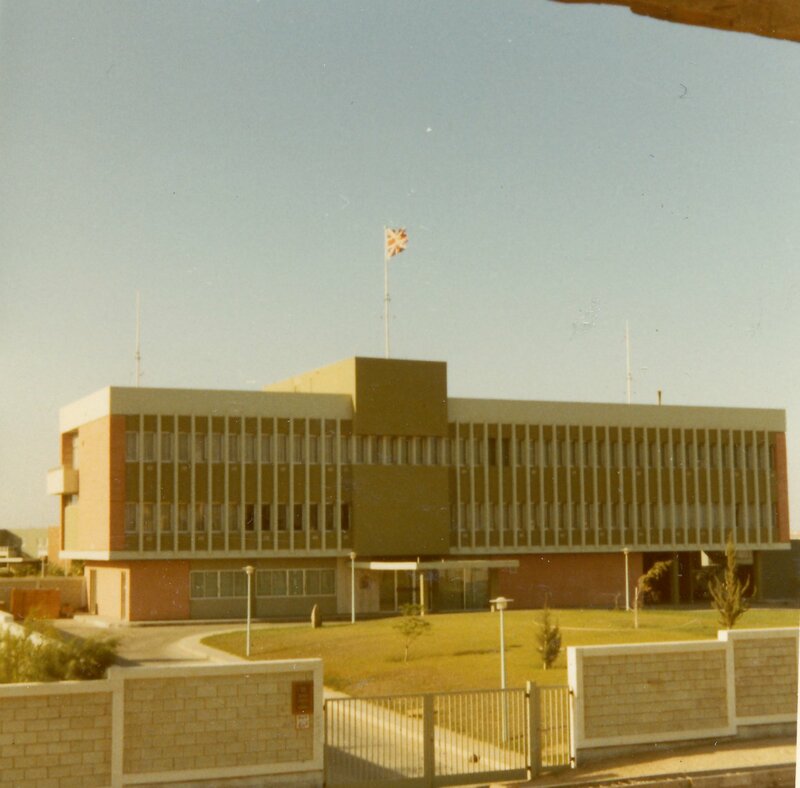 It was not, however, until 1971 that the embassy actually moved to the banal new 5.9 hectare compound, planned by the Saudi International Development and Consulting Company, containing offices, residence, amenities and 25 units of residential accommodation, and supporting facilities: only the commercial offices remained out-housed in the business area of the city. When the Embassy moved to Riyadh in 1985 a consulate-general remained in Jedda. For its accommodation, a 1.0 hectare compound, about 20 kilometres north of central Jedda, was leased from HRH Prince Abdulla Bin Khaled Al Saud. 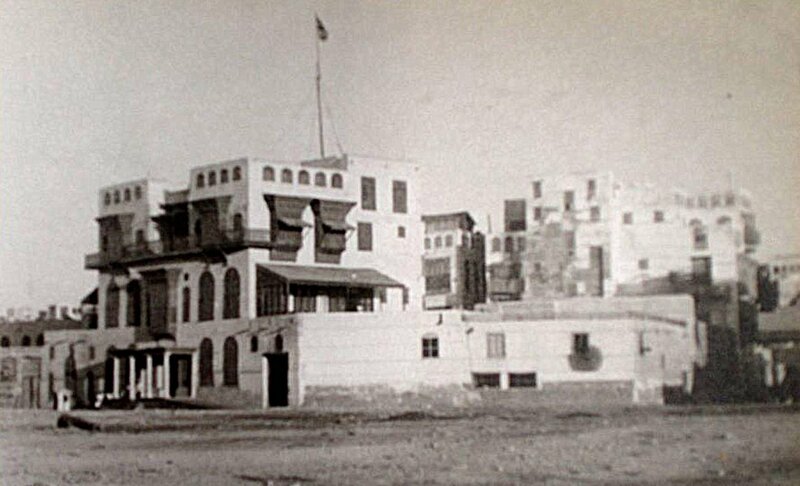 He also also funded the development on it, by Stanley Miller Arabia Ltd., of accommodation to FCO specifications. It comprised offices, amenities, and nine houses (including a pied-à-terre for the ambassador) plus, in a separate walled area, an amenity hall funded by the British Community, to be used for business, social and other functions. 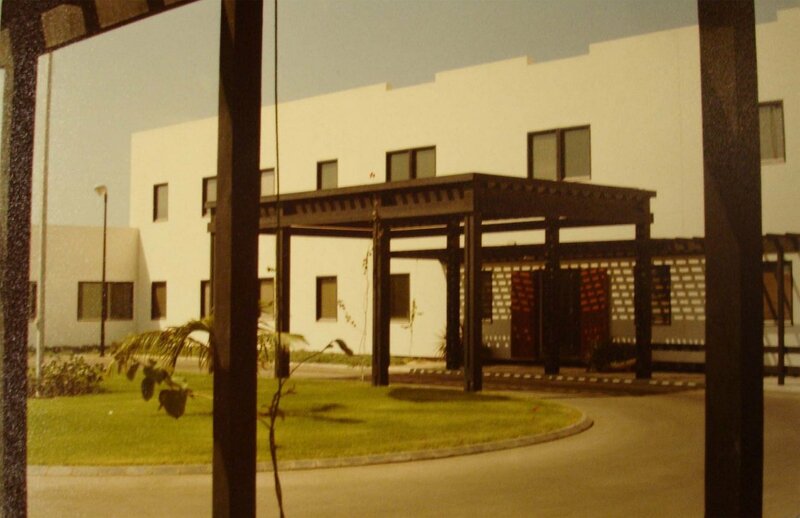 This compound was occupied in 1985, whereupon the former leased Jedda compound was given up. District plan, with legation buildings shown in Ash-Shan quarter, 1946. Aerial view of proposed compound site, 1946. Proposed layout foir new compound, 1949. Part of staff house terrace on compound, 1971. Staff houses in consulate-general compound, c.1990. Consulate-general offices entrance in compound, c.1990.